Czech MotoGP 2018 Live Stream Final Race & Qualifying Race Results: Its Dovizioso On The Pole After A Long Time, Rossi Grabbed the Second Spot & Marquez At 3. 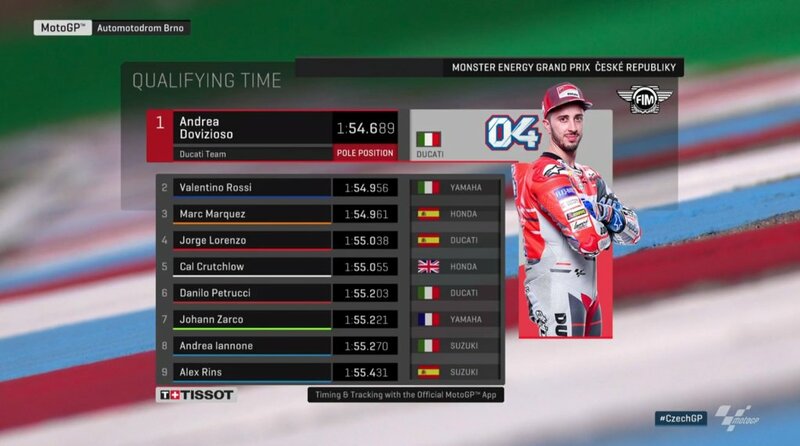 Andrea Dovizioso’s last flying lap put him on the pole position, his Italian mate Valentino Rossi moved to the second spot and defending champion Marc Marquez is at spot 3. It was a thrilling qualifying, Jorge Lorenzo looked all set for pole position until Marc Marquez sen the timesheets flying with a timing of 1:54.961. The challenge was soon picked up by the two Italians as Dovi & Rossi went even faster, Dovi registered 1:54.689 and Rossi 1:54:956. It will be interesting to see who will win the Czech MotoGP 2018, the first race after the summer break. Three superstars are already in the front row Dovi, Rossi & Marquez which guarantees a thrilling race. We already saw how hard Dovi & Marquez compete, and who forget classic Rossi & Marquez battle. Sportsfeista brings you all details of Czech MotoGP 2018 Live Stream Final Race, Schedule & Live Telecast Info of Grand Prix of Czech Republic. The live feed of Czech MotoGP 2018 will be available on MotoGP.com, Tenplay, Sony Liv and BTsport. All timings are in the local Czech time which is GMT+2 as quoted on official website MotoGP.com. For Indian Time, add 3:30 hrs to local time eg final race time on Sunday 17:30. In the UK the final race will relay on Sunday 13:00 BST. For Malaysian Fans, final race will telecast on 19:00 hrs on Sunday. The race will in USA & Canada 07:00 Am ET on Sunday.